Let’s review. 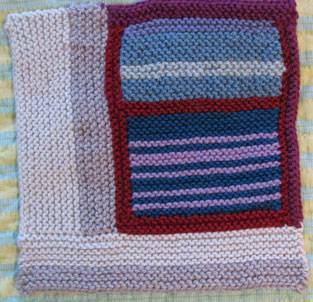 A few weeks ago we announced that we would be sewing up an afghan composed entirely of Carolyn’s squares made from vintage tapestry yarn. Remember?. 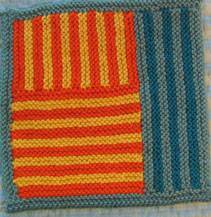 We are going to auction this amazing thing off on eBay and donate the proceeds to afghans for Afghans to help underwrite their cost of shipping warm handknits to Afghanistan. So, was it craven of me to post a picture that happened to show that there was one square missing from the layout? 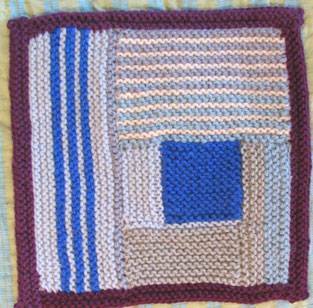 Would you believe me if I told you that I really and truly intended to use a bit of the tapestry yarn Carolyn sent me to make a ‘Carolyn tribute square’ myself, to fill that hole? You wouldn’t? That hurts me, but whatever. 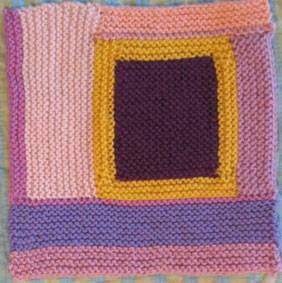 Six gorgeous squares. One to fill the gap, plus an entire new strip to add on. Each has a name. This is ‘Ocean View’. Is it my favorite? Possibly. I love images of windows. ‘Gemstone.’ When I saw this, I thought, ‘Sunflower.’ Yes, a square sunflower. I have no problem with that. ‘Baby Grand.’ Tee-HEE! It also reminds me of the flag. Perhaps the Flag of of the Great State of Carolyn. ‘Chaise Longue.’ Ain’t it amazing how a simple log-cabin stripey square can actually look like a chaise longue? I adore the colors. ‘Confection.’ I’m thinking, salt-water taffy. I am going to be inspired by these squares for a long time. 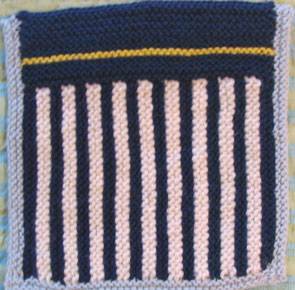 I love how many ideas can be evoked by the straight lines of a garter-stitch square. Thank you, thank you Carolyn. World’s kindest knitter, c’est you. 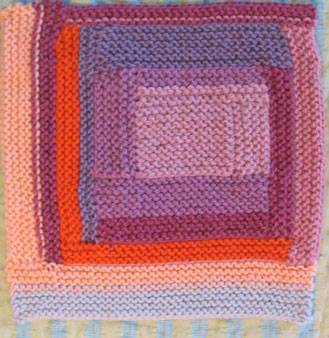 The knitters of New York will try to do them justice in the sew-up. If it’s not too personal… can I ask – does the bum sag if you sit down too long in it ? I mean the skirt’s bum not yours of course ? ! Heather, let me assure you and the General Public that this A-line skirt does not hug the derriere. When one sits, it does not stretch. Therefore, regardless of whether one’s bum is baggy–and I’m not saying one way or the other, and anyway it’s a matter of opinion–the skirt’s bum remains bag-free. Okay, time to head for points north, reeking of bug spray. What a novel idea… the squares I mean. I too love Ocean View but Chaise Lounge is another favorite. What a fantastic idea! …and *rofl* about the question! I’d rather get real questions like this one any day. Wowwee! These are beautiful!! I hope you’ll keep me in the loop about the sewing up sessions. Were your ears ringing this morning? We were talking about you. That afghan will be museum worthy. Can’t wait for the sew-ups. Have a good trip North. Have Deet Will Travel. Gorgeous- And inspiring. I think I know what I’m doing w/ my husband’s collection of t-shirts that cannot be worn and cannot be thrown out. Log Cabin quilt, here I come. 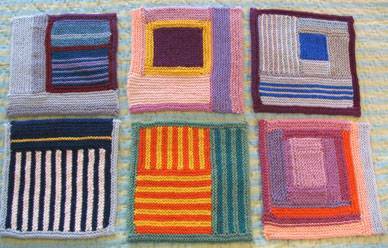 …..the neverending saga of my tapestry yarns continued….but these were the wee 8 foot lengths…so ideal for squares….besides, instant gratification warmed my soul, for such a worthy cause as this…. love! Jeepers, I can’t really get over Carolyn’s endless square imagination. They are each wonderful, and particularly amazing when seen together. Thanks so much for showing them to us in the appropriate up-close glory. And thanks too for the baggy-bum-or-not update. We all wonder about these things. Re: the question: I just adore bag-sag-free bums. Oh, and Carolyn rocks. What a wonderful person she is! She is a very talented person. This work is beautiful. And that she just keeps sending them in, wow. Maybe after it is finished, there should be some sort of dedication thingy in her honor? She definitely deserves something for all her time and generosity. Does anyone have a golden globe or emmy or some other award just laying around, gathering dust? One that could be dressed up with some sort of knitting decor? ‘Chaise Lounge’ reminds me of the Gee’s Bend quilts. Just lovely. The squares are so incredibly beautiful. Carolyn clearly has an amazing (and inspirational) eye for color. I am going to be bidding on the afghan for sure!